Today is a big day for Disney’s retail business. In one day, Disney has rebranded their online presence while debuting a new prototype store concept. The folks at Disney Store have been busy, so it is a bit hard to keep everything straight. We will try to break down all the news for you. 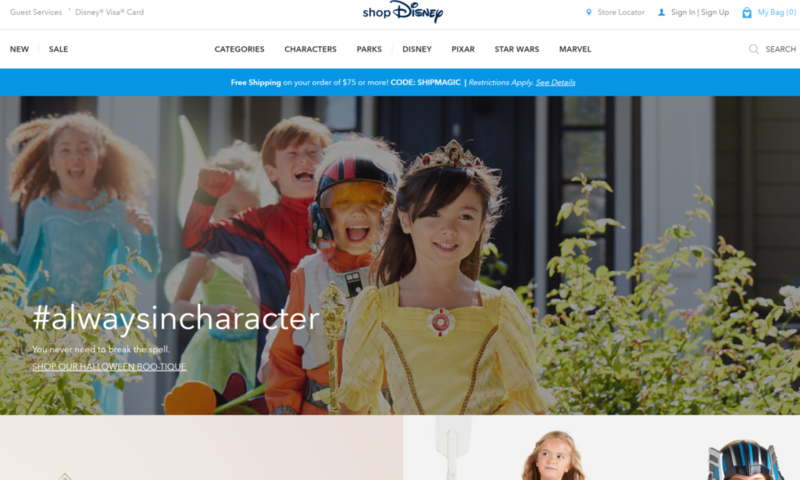 To start off with, Disney’s online retail presence has been rebranded shopDisney. The new website and app launched today, though it is important to point out that the Shop Disney Parks app remains separate. 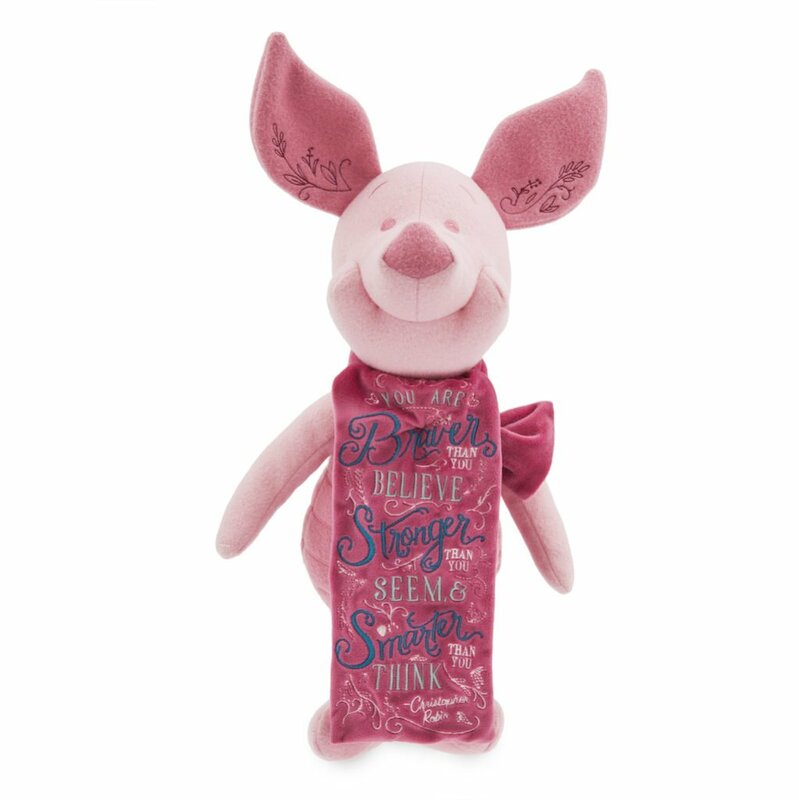 As you may have noticed, DisneyStore.com has recently been expanding their offerings by adding parks merchandise, partner products such as Ethan Allen and even selling pet costumes. This evolution is taking that expansion to the next level. Among the co-branded products and collaborations that will be featured include items from brands such as Coach, Le Creuset, Spyder, Steiff, rag & bone and more. 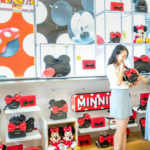 ShopDisney.com will also feature collections from “fashion-forward brands” within site’s shop-in-shop “The IT List” and is launching with denim from SIWY featuring Mickey and Minnie Mouse along with Disney Princess and Villain nail wraps from NCLA. So that is one part of the new strategy. The second part is the debut of a new prototype store that seeks to reimagine the Disney store experience. Gone are the Pixie Dust Trails and illuminated trees of the “Imagination Park” stores and in are a giant LED screen and a more brand neutral approach. We checked out one of the new prototype stores in Century City. At first glance, the store might seem a bit bland. The white walls are a stark contrast between the blues and purples of the previous concept. However, the stores want to be a place for all of the brands of Disney. 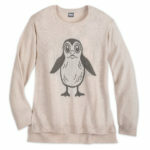 Instead of just focusing on the classic characters, the stores will feel appropriate for Marvel and Star Wars as well. They are also designed for flexibility to showcase whatever Disney property is front and center. The LED screen is key to this as it can showcase whatever has Disney fans excited at the moment. For example, the store could seamlessly transition from highlighting Halloween to The Last Jedi. 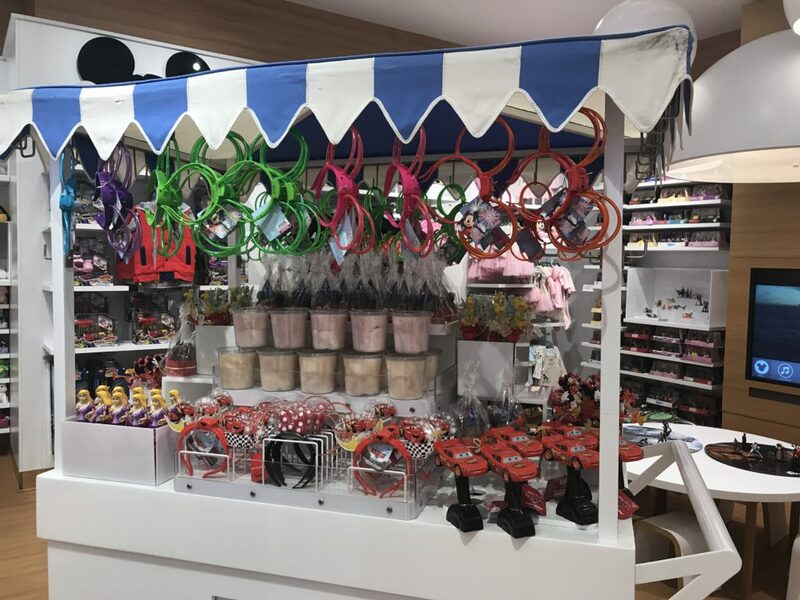 A quick way to see how the Disney store is evolving (besides dropping the capital ‘s’) is that there now will be opening moments themed to each of the Disney brands. 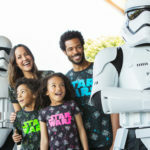 Instead of having the standard key ceremony, guests could be welcomed with a ceremony that is themed to Star Wars or Marvel. While the theming of the store is more light and contemporary aesthetically, it is the new tools the Cast Members have to make the Disney store be a Disney destination that ups the magic ante. For example, every day the parks will feature a live stream of a Disney Parks parade. Each evening, the store will feature a digital fireworks spectacular (but don’t worry, the shop will remain open for an additional hour for your shopping convenience.) The play area remains as well as the daily activities. The interactive screen has been upgraded so you can play with jigsaw puzzles, color, and more. 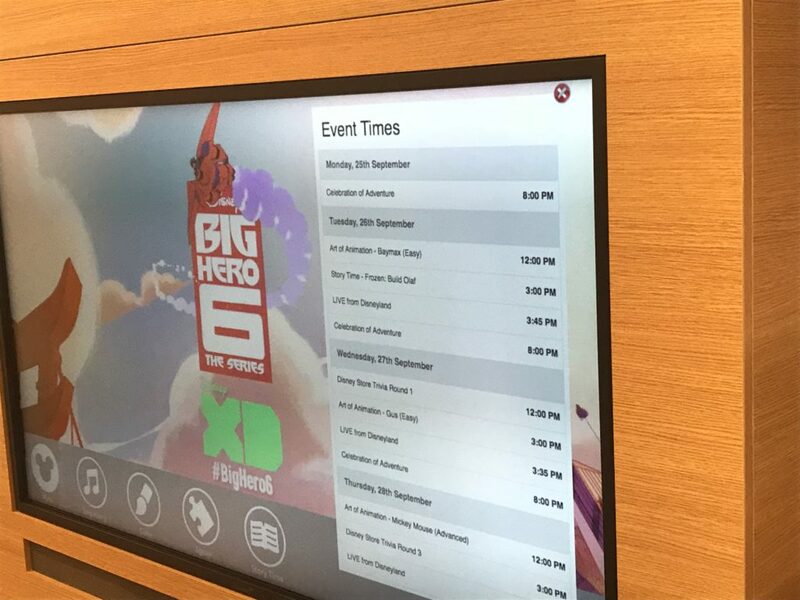 One can only hope that they will use the giant screens at the front of the store to live stream movie premieres and attraction openings as well. How cool would it be if you could join fellow Disney fans to watch those special moments together? Disney does aim to learn from these prototypes, especially during the upcoming holiday season. Not every Disney Store will immediately be converted. Disney kept stressing that they want to test and adjust the concept to ensure it is meeting their guests’ needs. So what did we think of the concept? At first glance, it was a bit stark. Some of us remember the concept they rolled out in 2000 that converted the stores into a glorified KB Toys and any character references were removed because they “cluttered the view of the merchandise.” But once you walk in, you realize that this new concept is very different. They are still embracing the Disney heritage, but have expanded it to the Disney of today and not the Disney of 1989. They needed a place where Marvel and Star Wars wouldn’t feel lost. To make up for any magic lost in the aesthetic, they upped the pixie-dusted experiences. The new interactive elements, the live streams from the parks, and a roll-out cart that looks like it came right off of Main Street USA, make this a destination that is more than what it appears on the outside. As always, what makes the store work is the strength of its Cast Members. They genuinely seem excited about all the new tools in their toolbox. As far as I am concerned, the main purpose of a Disney store is to bring Disney into every community which may not have easy access to a Disney park. These new stores do that thanks to the magic of the Cast Members. 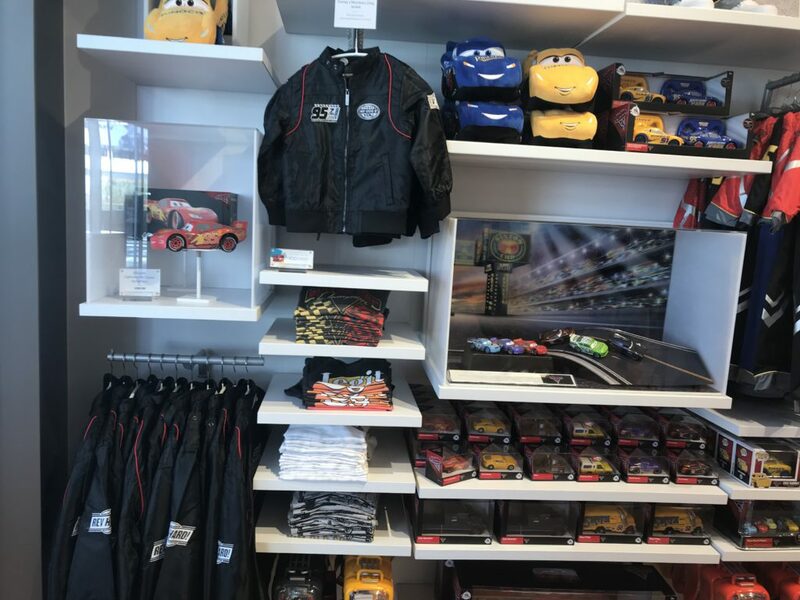 The new Disney store prototypes are now open in Century City and Northridge, California in the United States as well as in Nagoya, Japan and Shanghai, PRC. Two more prototypes will open in 2017 with one in Miami, Florida on September 28 and Munich, Germany later this year. If you are near one, check them out and let us know your thoughts.